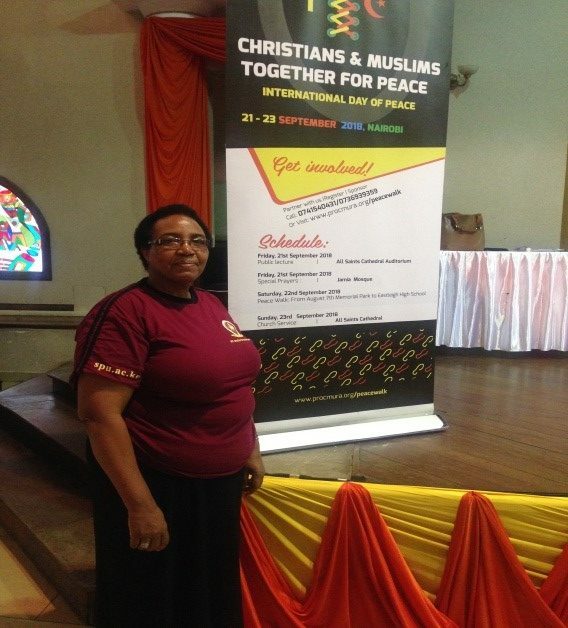 During this year’s International Day of Peace (21st September 2018), the Programme for Christian-Muslim Relations in Africa (PROCMURA) whose work is supported by St. Paul’s University where I serve as a Senior Lecturer in Peace and Conflict Studies, set three days of different activities in Nairobi, the capital city of Kenya, in order to bring together Christians and Muslims. Peace practitioners, peace scholars, government officials especially in the Security sector, University chaplains, lecturers, students from universities across Kenya, youth and women organisations, all engaged in these activities with the aim of creating a culture of peace — especially among Muslim and Christian communities. There was a different theme for each day. The theme for Day One: Moving Kenya towards sustainable peace and development: Countering/preventing violent radicalization and violent extremism. This day began with public lectures by scholars, Church leaders and government officials respecting gender balance. The auditorium (with a sitting capacity of 1800) was filled to capacity by mainly university students and other youth and women activists and peace builders. The presenters touched on the ‘approaches of countering radicalization and violent extremism from a Christian, Muslim, Gender, and Youth and Media perspectives’. There were plenary sessions where the audience was given the opportunity to seek clarifications or share their own personal experiences. One experience that remained with me was the sharing of one of the youth who said that he was on the verge of joining a militia group but the generosity of the people during one of his music concerts was a turning point. He made a decision to spend his life serving people by utilizing his talents for the good of humanity. There was also an opportunity for cutting of the peace cake and lighting of “Candles of Peace” which were given to a representative of all the groups present. The Christians also visited the mosque and the Muslims were allowed to break for their prayers at the appropriate times. The theme for Day Two: Peace Walk – Christian and Muslims Together for Peace: Stop Violent Radicalisation!! Stop Violent Extremism!! The walk was from August 7th Memorial Park (where the American bomb blast took place) to Eastleigh (where one of the most populated slums (Mathare) is situated. The peace walk started off with prayers (Christian and Muslims), the Kenya national anthem; and flagging off the walk. 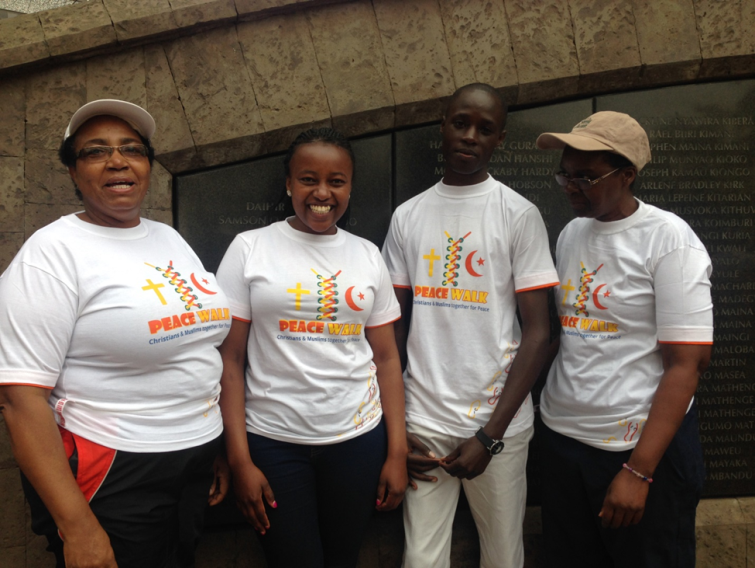 All the participants donned a white t-shirt with the Christian and Muslim symbols and at the front engraved the words: “Peace Walk” and “Christians and Muslims together for peace”. At the back were the words, “Stop Radicalisation!! Stop violent extremism”. The walk was animated by the Kenya Administrative Police Band and a youth-led peace caravan. The youth sang songs of peace, chanted peace slogans and informed the people about the theme of the day and its importance. “We the Christians and Muslims are saying no to violence, no to radicalization, no to violent extremism and yes to peace.” There were three key stopovers mainly in the less privileged areas of Nairobi where radicalization and violent extremism is more pronounced. On the last day, Day Three: There were special Church services and prayers for peace and victims of violent radicalization and violent extremism. Both the Christians and Muslims were involved in this too. Reflecting on the three days where I experienced us, Christians and Muslims sitting together in the same room, worshiping and eating together, visiting the churches and mosques without fear of one another, singing and dancing in rhythms of peace and not violence, playing football and walking together as we left our footprints of love, sisterhood and brotherhood as opposed to footprints of blood, speaking in one language of peace and love, the language of active nonviolence, I am convinced that another world is possible; a world where everything is turned upside down — our prejudices, our old held beliefs that continue to inform our decisions, especially regarding ‘us’ and the ‘other’. I am convinced of a world where children will play games without fear of a bomb, machete, spear, arrow, bullet, nuclear weapon; where people will not be afraid to embrace each other because they are different; where differences will be solved while sitting together, speaking to each other and sharing a meal as opposed to throwing different ‘missiles’ at each other and causing untold pain and suffering to each other. Through these activities I was also reminded that what unites us is more profound than what separates us. Violence severs us from each other and indeed from our true self. We were all created equal and have one common home, the earth, that embraces us irrespective of our colour, religious affiliations, race, ethnicity, gender and education backgrounds. “I live in hope that one day swords will be beaten into ploughshares and spears into pruning hooks and that no nation shall learn or experience war or violence any more.” (Isaiah 2:4). To read about the work of PROCMURA, website: http://www.procmura-prica.org/en/; the contact for their link with the St Paul’s University is http://www.spu.ac.ke/old/spu-academics/centre-for-christian-muslim-relations-in-eastleigh.html. ← Syria: The forgotten war?